XLVI.17-24; Tatian's Diatessaron (c. 150-160). "For as the vine and its branches are of one nature, therefore, His own nature as God being different from ours, He became man, that in Him human nature might be the vine, and we who also are men might become branches thereof." "And so their having Christ abiding in them, and abiding themselves in Christ, are in both respects advantageous, not to Christ, but to the disciples. For when the branch is cut off, another may spring up from the living root; but that which is cut off cannot live apart from the root." "Love brings about the keeping of His commandments; but does the keeping of His commandments bring about love?" "Whoever rests in Christ's doctrine abides in him, and therefore brings forth good fruit, and the Father will not deny anything to such a person as this." "From a vine we look for grapes, and from a Christian we look for a Christian temper, disposition, and life." "If any one abide not in me - By living faith; not by Church communion only." "As all spiritual fruitfulness had been ascribed to the mutual inhabitation, and living, active interpenetration (so to speak) of Christ and His disciples, so here the keeping up of this vital connection is made essential to continued fruitfulness." "On the table, from whence they had just risen, was the 'fruit of the vine,' and the Lord had said he would never drink it again upon the earth." Commentary, John 15:1-8, Meda Stamper, Preaching This Week, WorkingPreacher.org, 2015. "Like the good shepherd of last week's text, this week's image of the vine is another extended metaphor, which also borrows from and adapts Old Testament imagery for Israel." "On Being Pruned," David Lose, ...in the Meantime, 2015. "The cross was not the instrument that made it possible for God to love us, the cross is evidence and testimony to just how much God already loved us and God's promise to be with us through all things." "Remaining, Requiring, Receiving," D Mark Davis, Left Behind and Loving It, 2015.
" It seems powerfully suggestive to me to consider that "the word" of Jesus prunes us. Later, the Spirit will be that which convicts and convinces, but this metaphor of pruning seems very promising for preaching and teaching." The Risky Business of Bearing Fruit, Karoline Lewis, Working Preacher, 2015. "Bearing fruit is risky business. It will reveal who you are and on whom and what you depend. It will expose your lack of self-sufficiency." "Abide in Me As I Abide in You," Suzanne Guthrie, At the Edge of the Enclosure, 2015. "Do Not Flag in Your Abiding," Andrew Prior, One Man's Web, 2015. "The Vine Abides," storytelling, Story Divine, 2015. "Abiding Fruit," Jim McCoy, Ekklesia Project, 2015. "The Vine and the Branches and My Ash Tree," Janet H. Hunt, Dancing with the Word, 2015. "Connections," David Sellery, Episcopal Cafe, 2015. "Abide in Me," Rick Fry, 2015. "What Does It Mean to Abide?" sermon notes, Porter Taylor, The Liturgical Theologian, 2015. "The Vine Abides," Casey FitzGerald,Faith and Wonder, 2015. "Staying Open to the Source," Bob Stuhlmann, Stories from a Priestly Life, 2015. "The True Vine," Thomas Beam, 2015. Evangelio Comenario del San Juan 15:1-8 por Cristina Conti, Working Preacher, 2015. Commentary, John 15:1-8, James Boyce, Preaching This Week, WorkingPreacher.org, 2012. "In the promise of an 'abiding' presence God's Easter people find not some abstract speculation about a distant or imaginary Trinity, but an invitation to experience the Father, Son, and Holy Spirit as a saving and liberating presence in the midst of our day-to-day world." Jesus, the True Vine, audio telling, story in episodes, graphic, audio and written commentaries. Go Tell Communications, Biblical Storytelling for the Global Village, 2012. "Getting Real," David Lose, Dear Working Preacher, 2012. "I think one of the difficulties of living in our age is that we're offered a lot of things as substitutes for honest-to-goodness relationships, and while they may be pretty good at what they were designed for, they're finally not actual relationships." "Going Wild," Paul Bellan-Boyer," City Called Heaven, 2012. "A vine will grow in any direction it is able. But Jesus' heavenly Father tends the vine..."
"Make Your Home in Me," Alye M. McKenzie, Patheos, 2012. "Our lives express our relationship with Christ as the vine for which we are the branches." "So for Jesus to say--or for the fourth gospel to have him say--that he is closer to God than Israel does not mean the superiority of Christianity over Judaism. It means the superiority of the way of Jesus over the way of the Judean religious power structure." "The Vine and Core Strength," Janet Hunt, Dancing with the Word, 2012. "How do you experience Jesus as your 'core strength' or your vine?" "Abide is a wonderful verb," Katie Munnik, Presbyterian Record, 2012. "Abiding in God is our response to the good shepherd passages, and involves community as well as individual action." "Vines and Branches?" Nadia Bolz Weber, The Hardest Question, 2012. "There’s not a lot of agency for us in this text. God prunes us." Holy Textures, Understanding the Bible in its own time and in ours, John 15:1-8, David Ewart, 2012. "However, loving someone is not the same as feeding them. When we feed someone, we usually give them something they don?t have. But when we love someone, we don?t give them something they don?t have. Rather, we connect with something that is already in them." Comentario del Evangelio por Amaury Tañón-Santos, San Juan 15:1-8, Working Preacher, 2012. Commentary, John 15:1-8, Susan Hedahl, Preaching This Week, WorkingPreacher.org, 2009. "First Thoughts on Year B Gospel Passages in the Lectionary," Easter 5B, William Loader, Murdoch University, Uniting Church in Australia. "The image of the tree, vine or plant is a rich source for spiritual reflection. It invites us to sense the divine as beneath us, rising up, rather than above us condescending." "Faith is always changing. Even though one is connected to the true vine. Even though one's faith is firmly rooted in Jesus Christ. Though the "root" of one's faith never changes, but from year to year one's faith needs pruning by God. Maybe some old habits or thoughts or attitudes or behaviors need to die, so that, through the power of Jesus, even more fruit will be produced in one's life." "Your Purpose in Life," Preacher's Magazine, 2006: Listening to the Text, Engaging the Text, Preaching the Text. "Connection," Larry Broding's Word-Sunday.Com: A Catholic Resource for This Sunday's Gospel. Adult Study, Children's Story, Family Activity, Support Materials. "Do you consider yourself a team player or a loner? What are the advantages and disadvantages of each type of person?" Wellspring of the Gospel, Easter 5B, Catherine McElhinney and Kathryn Turner, Weekly Wellsprings. "Take a trip to a vineyard if you can - or a garden centre - and learn about growing vines." John 15:1-8, Austin Presbyterian Theological Seminary's An Exegetical Study of the Common Lectionary, coordinated by Prof. John E. Alsup, features rough translation, disposition, immediate context, broader context, hermeneutical bridge, and contemporary address. "There are numerous Old Testament passages which refer to Israel as a vine: Ps. 80:8-16, Isa. 5:1-7, Jer. 2:21, Ezek. 15:1-8, 17:5-10, 19:10-14, and Hos. 10:1. The vine became symbolic of Israel, and even appeared on some coins issued by the Maccabees." "Abiding in Christ (John 15)," by Robert Deffinbaugh at the Biblical Studies Foundation. "The nature of the relationship between Christ and His followers was to change from a physical one to that which was spiritual, and the means of sustaining this kind of relationship are described for us." "Eating and Bearing Fruit," "Fly Fishing and Faith: It's About Connection," Dale Fletcher, Faith and Health Connection, 2009. Baarda, Tjitze, "Archaic Element in the Arabic Diatessaron: Ta 46:18 // John 15:2," Novum Testamentum, 1975. Brosend, William, "Abiding Love," The Christian Century, 2000. Caldwell, Frank H., "'Contact! ': A Homily on John 15:1-12," Interpretation, 1947. Crossan, John Dominic, "Aphorism in Discourse and Narrative," Semeia, 1988. Dillow, Joseph C., "Abiding Is Remaining in Fellowship: Another Look at John 15:1-6," Bibliotheca Sacra, 1990. Eickmann, Jerrold A., "Third Sunday of Easter: John 15:1-8," Concordia Journal, 1985. Hutchinson, John C., "The Vine in John 15 and Old Testament Imagery in the "I Am" Statements," Bibliotheca Sacra, 2011. Laney, J. Carl, "Abiding Is Believing: the Analogy of the Vine in John 15:1-6," Bibliotheca Sacra, 1989. Lueking, F. Dean, "Abide in Me..." The Christian Century, 1998. Peterson, Robert A., "Union with Christ in the Gospel of John," Presbyterion, 2013. Segovia, Fernando F., "The Theology and Provenance of John 15:1-17," Journal of Biblical Literature, 1982. Warner, Andrew, "Kingdom Come," The Christian Century, 2003. Wilson, Stan, "On the Vine," The Christian Century, 2006. Wink, Walter, "Abiding, Even under the Knife," The Christian Century, 1994. "Abiding Fruit," Juan Huertas, Day 1, 2015. "Neither Heaven Nor Hell," the Rev. Benjamin Anthony, Day 1, 2009. "Well-Connected Christians," the Rev. Dr. Wiley Stephens, Day 1, 2006. "Much Fruit," Pastor Edward F. Markquart, Sermons from Seattle, 2006. "The Branches," Easter 5 - 14 May 2006, Luke Bouman, Göttinger Predigten im Internet: Every Sunday Sermons based on the RCL by a team of Lutheran theologians/ pastors. "A Branch on the Tree, or a Stick in the Mud?" Charles Kirkpatrick, Sermons4kids.com. "Jesus Is the True Vine," Sunday School Lessons: Family Bible Study, art projects, music, stories, etc. "The True Vine," children's study, puzzles, coloring sheet, etc. Higher Praise Christian Center. Clip Art, John 15:5, Fr. Richard Lonsdale, Resources for Catholic Educators. Clip Art Images: John 15:1-8, Misioneros Del Sagrado Corazón en el Perú. John 15:1-8, at Cerezo Barredo's weekly gospel illustration. Liberation emphasis. You Tube videos: Vine and Branches (Muddy River Media), I Am the Vine (Causeway Coast Vineyard), I Am the Vine (Ken Medema). 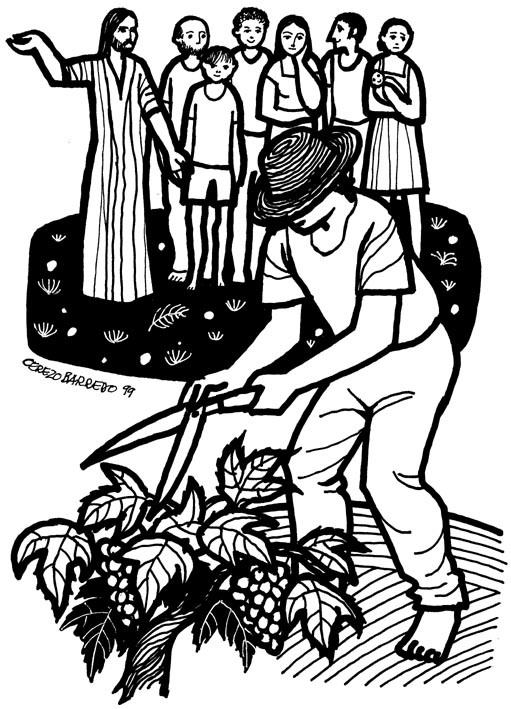 Commercial Site: I am the Vine (John 15:1-8), Visual liturgy / videos for Easter 5B, The Work of the People. John 15:1, John 15:1, John 15:1-17, John 15:2, John 15:8, Heartlight - Free Christian PowerPoint Backgrounds. "You Are the Source," Hymn based on John 15:1-8, Lisa Ann Moss Degrenia, 2012. Hymns with Scripture Allusions: John 15:4, 5. The Cyber Hymnal.